Revised and updated throughout, this unique anthology examines global environmental politics from a range of perspectives and capturing the voices of both the powerless and the powerful. Paradigms of sustainability, environmental security, and ecological justice illustrate the many ways environmental challenges and their solutions are framed in contemporary international debates about climate, water, forests, toxics, energy, food, and biodiversity. Organized thematically, the selections offer a truly global scope. Seventeen new readings explore climate justice, globalization, land and water grabs, climate change and conflict, China’s international environmental relations, and the future of climate politics in the wake of the Paris Agreement. This book stresses the underlying questions of power, interests, authority, and legitimacy that shape environmental debates, and it provides readers with a global range of perspectives on the critical challenges facing the planet and its people. 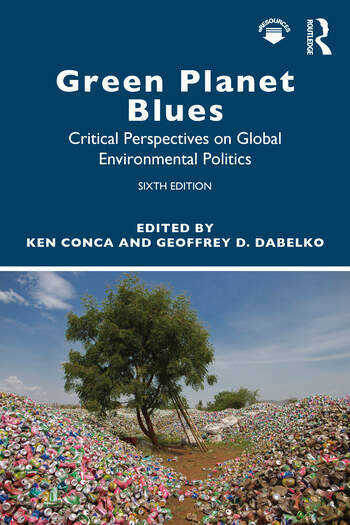 This new edition of Green Planet Blues connects directly with a wide-range of upper-level undergraduate and graduate-level courses. Introduction: From Stockholm to Sustainability? Donella H. Meadows et al. 10. Transnational Environmental Activism in North America: Wielding Soft Power through Knowledge Sharing? Part Five: From Ecological Conflict to Environmental Security? Ken Conca is professor of international relations in the School of International Service at American University. He is the author and editor of several books on global environmental politics, peacebuilding, global governance, the United Nations, and the politics of water. Geoffrey D. Dabelko is professor and associate dean at Ohio University’s Voinovich School of Leadership and Public Affairs. He is also a senior advisor for the Environmental Change and Security Program at the Woodrow Wilson Center in Washington, DC.